This weather is ridiculous. So far this month, we’ve had sunny spells interspersed with heavy showers, meaning we’ve got a beautiful view of a lot of rock that is perpetually too wet to climb on. And as a consequence, a dad here who is getting more and more frustrated at the world. This happens this time every year. I often comment on weather patterns and that if the latter half of July and August is wet, September normally comes out to be dry and pleasant. A dry August will normally see us suffer from damp, potentially until the spring. So far, autumn 2017 isn’t looking that good. With being off with Rosie, it’s mostly been a case of making the best of it and trying to get out as best we can and while it seems we haven’t done that much since my last post, looking back through the pictures on my phone has actually just shown me we’ve done pretty well after all! 30th August, two days after saying my farewell to Clare, i actually managed to escape for some baby-free time and head back up into the pass. I’d been keen to head to the Meadow and re-tick Killer Weed 7a for a little while and now, with Em and Rosie potentially to follow on a bit later, i took Tess up for a session. On the way, i bumped into an old friend, Mikey, and a youngster he was working with, who opted to take the long trudge up the hill to join me. We got distracted on the way at the Wavelength boulder and started ticking. Despite being there only a few weeks previous, No Retro Ticks came into play and i repeated almost everything again and in a wonderful example of why it works, ended up ticking off a new line, Gav’s Sitter 7a+ on the second effort! Two days later, we were out again, back at the Brenin boulder to see if it had dried enough since our last effort. Land Rover parked in the bushes, pads and baby crap carried in and very quickly it became apparent that the slightly high but easy top out was wet and slimy. While easy and not scary in the dry, in these conditions, it could be a touch treacherous and alone, it just wasn’t worth it. Instead, we bid retreat and headed to a small party to say farewell to this year’s crop of Centre Assistants – a great bunch of guys who will, i’m sure, all go on to great things. The following day, with no rain since then, we tried again. Without even taking the baby up to the crag from the track this time, it was evident that it was still too damp so the backup plan came into effect: the RAC boulders. The RAC is an unusual crag, having an abundance of easy lines but without much in the harder grades and since i began generally operating in the higher 7s, it’s somewhere i’ve normally avoided. Most of the lines i’ve done before and weren’t actually that challenging so the idea of going and repeating them again never really inspired. The difference now is a new guidebook to tick and a very baby friendly crag. Plus, there’s a load of new stuff that is actually that little bit harder now. Old habits do die hard and i quickly ran up and down most of the climbs on the easier lower boulder, one after the other. It did, i must admit, feel very good to get some mileage in and did tire me out a little. Next was the front face on the other boulder and after finding a safe little dip to leave Rosie, i happily repeated most of the lines, trying On One 7b+, the hardest climb at the crag, to little avail. I did, however, forget to tick the 7a Frontside Traverse which is a little frustrating. Since then, outdoor climbing has become nothing more than a dream. Where the weather was glorious on the Saturday at the RAC, the Sunday was nothing more than a deluge for Em’s birthday and her planned trip up Crib Goch was undoubtedly cancelled. Instead, in search of some shelter from the torrential drizzle, Em, her brother James and his partner Rachael, their mum, Rosie, Tess and myself all went for a little wander through Beddgelert forest. It had crossed my mind to do a bit of boulder scouting but that wasn’t the point of the day and it wouldn’t have been right to try and hijack it. This was Em’s birthday and despite the poor weather, it was a lovely family day out, topped off with food and tea in the Hebog cafe in Beddgelert to dry out a bit. A dry day the following Wednesday (that i’d forgotten about) was stymeed by a cement mixer making a hash of getting up Goodman Street here in Llanberis and managing to spill a large amount of concrete all over the road… and the cars parked along it. Three cars took the brunt, including the Land Rover with a splash on the front wing. She was in desperate need for a clean and a polish anyway so that was the plan for the rest of the day and to be fair, she looked absolutely sparkling afterwards. Problem was, the day after, i noticed cement underneath, on the suspension, diff, brakes, all over so my beloved green machine is currently away being tended to while we cruise North Wales in a Nissan X-Trail. It proved quite useful for our Non-Climbing Commitment (or NCC) in Birmingham at the weekend, giving us an economical and comfortable ride there and back. A party for some old friends on the Saturday evening was preceeded by a trip to the Botanical Gardens in the daytime and to be fair, it was an excellent weekend. Since then, it’s been a case of timing the gaps between showers and getting pissed off. Thankfully, Rosie has grown to the point where she is now able to ride in the rucksack carrier and so, armed with a steak pie and a smile, on Monday gone, we went boulder scouting once again, to the Llyn y Gadair boulders and then possibly further into Beddgelert forest – a spot seemingly turning into our second home lately! Sadly, on arrival in Birmingham on Friday evening, i’d decided i was only going to get strong if i exercised more and went for a run. An hour later, dripping in sweat, i had staggered back and my legs hadn’t quite recovered by our walk on Monday, meaning that as time wore on and progress slow, we cut the walk short and headed home. Llyn y Gadair looks good for a short session though. Looking back, it seems i’ve not actually been that unlucky after all and it’s surprising how high are the standards i’ve set myself of late. 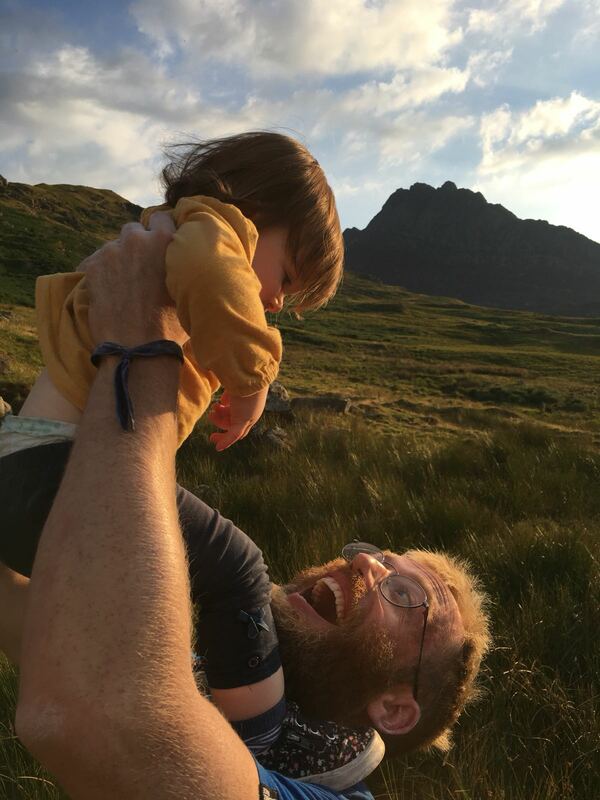 We’ve actually been getting out much more than i’d realised and given i have a young child in tow, I’ve been spending my mornings writing lately on how you can maintain much of your old life once a baby arrives and it’s important to remember what you have done. Once you’re into the day to day routine, it’s easy to think you’ve not done enough.